• How did ‘they' get booked on that TV show? • Why did that company get the feature story? • How can I become the go-to expert on TV? Katrina Cravy is an Emmy Award-Winning TV media veteran and author who wore headgear to high school. 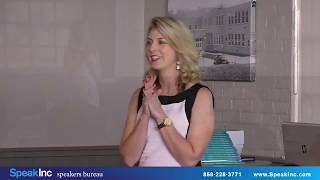 Her fun-loving but get the job done style has made her one of the most trusted and well-known names in Southeastern Wisconsin, although her career has taken her across the country. Katrina has worked as an investigative reporter, anchor, and talk show host, for FOX, NBC, and ABC affiliates from Parkersburg, West Virginia to Portland, Oregon. With more than 20 years of media experience, Katrina is now a member of the National Speakers Association. She's on a personal mission to help teams and executives be their best on camera and communicate with confidence during the good times and the bad. Her book, On-Air – Insider Secrets to Attract the Media and Get Free Publicity promises to make you think like the media. Katrina is also an adjunct facility member for the University of Wisconsin's School for Professional and Executive Development teaching crisis communication skills. Companies like Aflac, GE Healthcare, A.O. Smith, MGIC, and Salvation Army have booked Katrina as a keynote speaker and trainer to boost their teams' performance. Besides winning a regional Emmy, she has also received awards from the National Press Club, Associated Press, Wisconsin Broadcasters Association, and Milwaukee Press Club. This California native graduated from the University of Southern California with a double major in broadcast journalism and political science. She was chosen as an intern for the Office of Ronald Reagan in 1991 and received USC's "Outstanding Broadcast Journalism Senior" award in 1992. Katrina Cravy loves speaking to audiences from around the country, almost as much as she loves her husband, their son, and their two cats. You're smart, driven, and good at what you do. But that alone won't be enough to score you a promotion or corner office. Find the bigger YOU and how to communicate with confidence to inspire your colleagues and customers. If you've ever wondered how did "they" get booked on that show? Why did that company get the feature story? Katrina knows. Grab her recipe to spice up your story and have the media begging for seconds. Don't let a sudden crisis damage your brand and reputation! Make sure your C-Suite officers know how to say the best words at the worst times. Let Katrina help you build you compass team now to send a winning message to your employees, your customers, and the media. Buckle up to have some fun and scream down the "Female Freeway" together. You might need a helmet for where this super-charged conversation is headed. Let's honk the horn and celebrate what it takes to be a woman leader at home and at the office. Learn why we should be ruling the world!